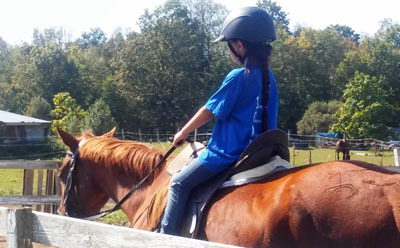 Missy came to us as a little filly who had seen so much of life already at such a young age. What she had not gotten to truly experience though was the love of a child. She got two little girls, and a little boy of her own, and the love of a number of other children up at our barn when she came to live with us. Heartbreakingly, she was just too much good to be contained in such a small package as a horse's body, and she left to meet us at the Rainbow Bridge. She will live on forever though in a little girl who had been afraid to trot, and yet for one day, threw caution to the wind, and trusted her horse to carry her through what terrified her. As that little girl grows up, and continues learning, I'll never forget the day I watched her giggling and singing to our beautiful Missy as they merrily trotted along.